LAHORE: (Thursday, April 5, 2018): Renowned human rights activist and wife of Held Kashmir’s leader Yasin Mullick, Mrs Mushaal Mullick has said the Indian forces are brutally killing innocent Kashmiris daily and people of Held Kashmir have high expectations from Pakistan for resolving their issues. She said that if Pakistan did not help Kashmiris, India would stop Pakistan’s water and Pakistani people would not have access to drinking water even. 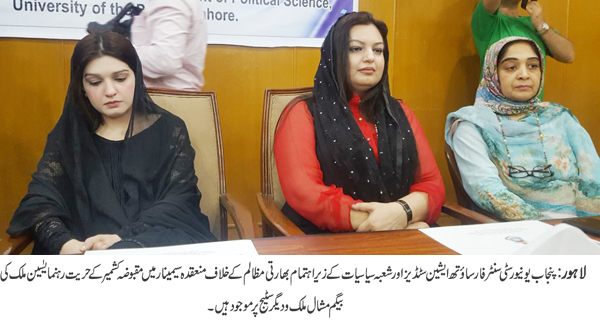 She was addressing a seminar on Indian atrocities in Kashmir organized by PU Centre for South Asian Studies and Department of Political Science here on Thursday. Prof Dr Umbreen Javed, renowned columnist Dr Mujahid Mansoori, faculty members, PhD and M Phil scholars participated in the seminar. In her address, Mushaal Mullick said that Mushaal Hussein Mullick discussed the Indian Atrocities which were going on in Kashmir. She said that Kashmiris were praying and looking over Pakistan for their help. She requested the youth to join hands with her to help poor Kashmiris. She said that youth could play important role in Kashmir cause through twitter, youtube, facebook and other social media networking options. Prof. Dr. Umbreen Javaid in her welcome address thanked to Mushaal Hussein Mullick. She said that Kashmir was burring today and people of held Kashmir were looking over us. She said that we should help them save their lives. She further said that it’s the youth which must come forward and play role for liberation of Kashmiris from occupied forces. The seminar was followed by question-answer session in which all the faculty members, students and research scholars participated.